Week two of my “Forgotten Heroes” project didn’t get started till Sunday. 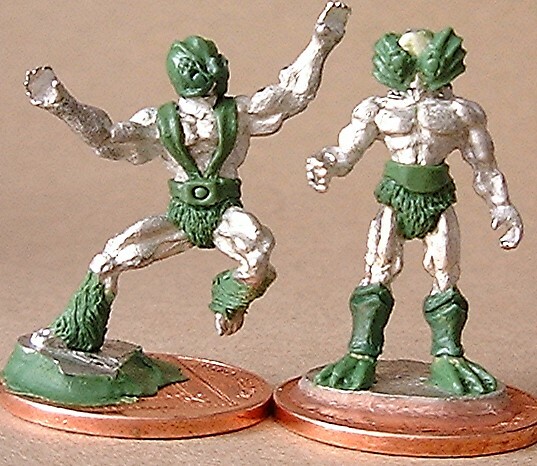 Indeed hobby time has been very limited all week, still once I got chance to have a bit of a bash at these two miscreants I was able to move them along and get some of the “bits” done I was nervous of doing one of which was Mer-man’s face and the other was Stratos’ face plate. I began this by adding two blob’s of putty over his eyes then shaped these into a sort of butterfly shape before adding two eye lenses in the same way as I did the detail on his belt buckle, a bit more “faffing” about and I was happy, I then added Mer-man’s greaves, these were just two blobs of putty slapped onto the front of his shins then smoothed out around his calves and shaped with one of my colour shapers to the right shape. I added the “double top” details to them next by pushing a ridge around the top of the front, and then smoothing this to shape. 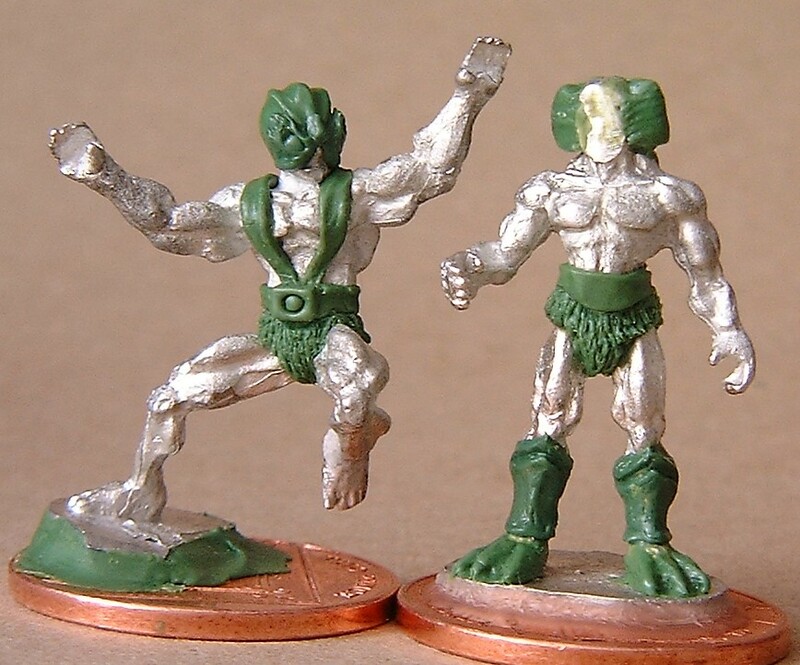 Tuesday, and it was time to bite the bullet and start adding Mer-man’s face, so taking two small “cones” of putty, I placed one either side of his face, on the “lugs” I’d already added, then after smoothing these down towards where his cheeks would be I pushed in the “fins” with my pointed colour shaper, defining these more with my pointed probe. I then pushed the curves into the outer edges of these to complete the “fin” effect, not exactly like either the cartoon or action figure, but a little like both, so I was happy. I then took two tiny balls of putty and set then into the fins as his eyes, adding the centres as I did with Stratos’ and using the tip of my small knife to push the details in around them. Then turning to Stratos’ himself, I added his “hairy” lower legs (the action figure uses the same legs as Beastman, you see), now whether these are supposed to represent feathers I don’t know, but I decided to add them anyway, and indeed made the hairs longer than on the original to strengthen the ankle where it meets the floor and to hide some of the foot on the raised leg, these were just blobs of putty pushed round his shins and then the fur was tapped in like I did with their pants. Thursday, and it was straight to work on Mer-man’s face again, I started by running some putty over the top of his head, and down the back of it, then smoothed this to a thin layer. Next I made a small cone of putty and placed it on the lower centre of his facial area, and blended this into the upper part just applied, I then pushed his mouth in with the end of a cocktail stick, finally here I ran a small sausage of putty across the top of the fins and eye area, and smoothed this into a sort of eyebrow. Turning to Stratos’ I rolled out two tubes and applied them on either side of his rocket pack harness, then taking the cocktail stick again pushed it up the bottoms of the tubes to form the rocket vents. The feathers on the shoulder straps of his harness were next, there are six of these (three on each side), these were just small ovals of putty, pushed into place, then flattened, and the feather details were then tapped in with the blade of my small knife (you can’t really see them in this photo, but I’m sure they will be in view once I take one from round the front again). 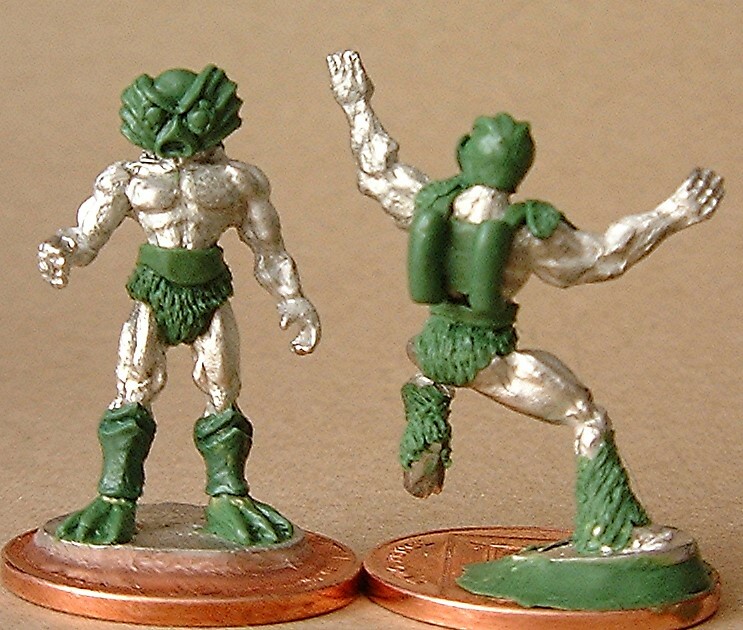 Friday, set to work on the armour that runs up Mer-man’s chest today, firstly I ran several mall sausages of putty across his chest, from the top of his belt up to the top of his “pec’s” and these were then detailed by pushing ridges vertically into them. I then ran a “rope” of putty around his neck in a wide loop, and set his shoulder pads off of this, these were just teardrop shapes of putty, put over his shoulders, and then the “fin” style details were pushed into these (in the same way as his head fins) using my pointed colour shaper. Then turning to Stratos I added the first three of the feathers on each of his arms (he needs six on each) these were done in exactly the same way as the ones on his shoulders. The end of the sculpting though not exactly “in sight”, is definitely a few “stations” nearer now, though I starting late again this week as I went to Phalanx wargames show yesterday (mainly to sell on the “bring and buy”, but I did buy a couple of packs of figures, my first for nearly two years!) hence this late post. Oh well better crack on as they say. Till next week, Excelsior Roger. Thanks Dave, no have never tried that method (I try to avoid feathers as much as possible TBH), Stratos’ feathers are pretty flat on the original, but if I have to do anymore though I’ll give it a go. Thanks for the tip. Forgot to say did you have a good time at Phalanx ? Phalanx was OK, the chaps that run the show are always really friendly and helpful. The B&B was heaving! and really hot, didn’t help that the hall had double booked, so they had to move the B&B up into the café (so no food or drink, apart from a “butty wagon” on one of the tennis courts, luckily we took our own). The main hall looked pretty quite tbh, didn’t seem to be much money being spent (including by me). The game look pretty good but nothing really inspiring. All in all a good day but not a great day, would have been disappointed if it wasn’t half an hour away. Excellent work as always, Roger. They’re certainly starting to look more like they should. It’s a bit like watching a Polaroid develop, each picture in each post slowly advances the progress. They are certainly taking shape now. Good progress, Roger. Thanks Bryan, just wish I had a bit more time to get them done. Thanks Michael, they are coming along slowly. Ah, Roger…I think I see where I may have been going wrong with the green stuff. 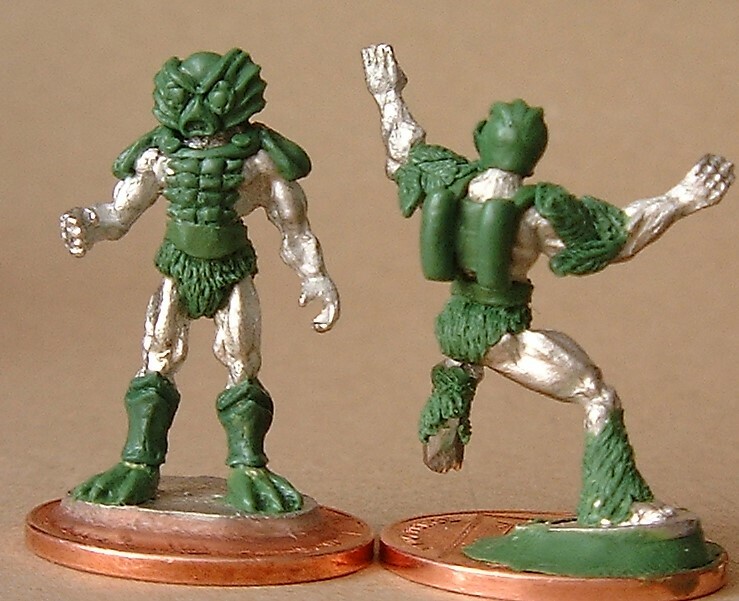 I’m trying to do everything all at once, rather than in stages, as you have done with Mer-Man’s face fins, for example. I still find green stuff sticky and tough to work with, but I think if I build things up slowly and have the patience to wait, I might enjoy better results. That being said, great work on both, and your descriptions of the process are quite helpful. Looking forward to seeing these two Eternians when finished! Thanks Keith, yep I find the best way for me is to build things up slowly in layers, though remember to think ahead, if you have to fit an eye or belt, whatever you will need to add the socket or ridge that it will sit in as part of the layer before, I takes a little thinking ahead, but you get used to it over time (I however am still not infallible here, and much swearing often ensues!). Great work, Roger. These green stuff WIP postings of yours are always a highlight of “Forgotten Heroes” for me. An interesting ‘viewpoint’ on Phalanx – I used to travel up to that from the South Coast many years ago for a few shows, but rarely felt it was vfm for such an excursion. I used to travel up and down the country years ago (before we traded) to show nearly every two to three weeks back in the day, I don’t know as I’d do it thhese days though. Petrol was a lot cheaper and there were a lot more shows tbh. Nice progress Roger and I love the planning process you are undertaking for these two. I am learning from you! So much patience and perseverance and planning. Can’t wait to see the final project ! Thanks Mark, you are learning from me!! talk about the blind leading the blind! Interesting that you should mention the three P’s though when it comes to sculpting though, however in my case it’s less….Patience and Perseverance and Planning, and more… Plonk it on, Push it about and Pray!